Update: We now know these will go live on May 22. Enjoy your decks while they last, everyone! 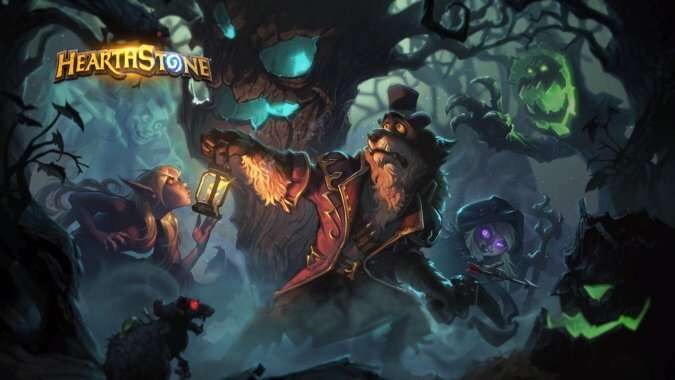 Hearthstone’s post-Witchwood nerfs are coming, and will bring a few changes to the meta… though perhaps not as many as we’d like — particularly to the superpowered Cubelock. But let’s not hang around up here in the introduction. Here’s what’s actually happening in Hearthstone. Dark Pact: There are two aspects of Dark Pact that make it powerful. At a cost of 1 mana, it’s easily used alongside cards like Carnivorous Cube, Possessed Lackey, and Spiritsinger Umbra for big combo turns. It also gives Warlocks enough healing potential so that aggressively using Lifetap and playing cards like Kobold Librarian and Hellfire feel less consequential. 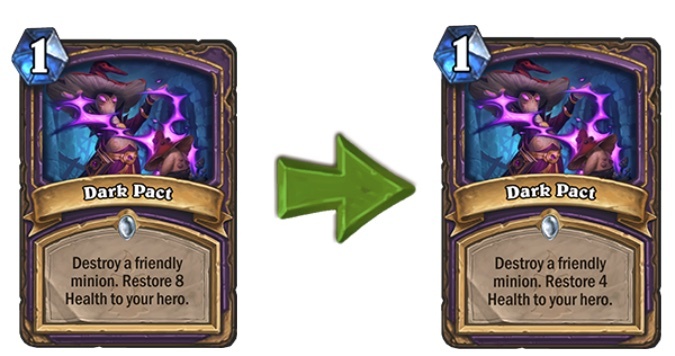 We left Dark Pact’s cost intact so it can still be used as part of interesting combos, but lessened the healing it provides so Warlocks will need to more carefully consider how much damage they take over the course of a match. Possessed Lackey: Some of the card combos involving Possessed Lackey present situations that are too difficult to deal with in the early-to-mid stages of the game. Increasing its mana cost to 6 delays some of those powerful card combos to turns that are easier for opposing decks to overcome. Spiteful Summoner: After set rotation arrived with the Year of the Raven, Spiteful Summoner became more powerful and consistent when used in decks containing 10 mana cost spells. This is because the pool of 10 mana cost minions in Standard is smaller, so players could more reliably count on getting a powerful minion from Spiteful Summoner’s effect. Even considering the deckbuilding sacrifices that an effective Spiteful Summoner deck requires, we think that increasing the card’s mana cost to 7 is more in line with the powerful outcomes that are possible when it’s used alongside cards like Ultimate Infestation. This was a staple card in the popular Even Paladin archetype because without any 1-mana minions to choose from, it would always snag three 2-mana minions. That gave the card great tempo value… but a mana cost increase cuts it out of Even Paladin decks entirely. In the also popular Odd Paladin archetype, the card is of more limited use as it will only ever summon three 1-mana minions. For five mana, you’re better off just summoning the minions yourself. Still, this card could prove valuable in other decks… but it’s no longer an Even Paladin darling. Call to Arms: Currently, there are three popular Paladin decks: Even Paladin, Murloc Paladin, and Odd Paladin. Among the three decks, Even Paladin and Murloc Paladin have consistently been the most powerful two archetypes over the first few weeks since the release of The Witchwood. Call to Arms moving to 5 mana restricts it from being used in Even decks and reduces its power somewhat when used in Murloc and other Paladin decks. We expect that players will experiment with Call to Arms at 5 mana in Odd Paladin decks, but we don’t expect this card to have much of an impact. This is because Odd Paladin can’t access 2 mana minions (meaning Call to Arms could only ever summon three 1 mana minions if played in that deck). I have to say that I have a ton of trouble defeating Quest Rogues if I can’t end the game before they complete their quest. 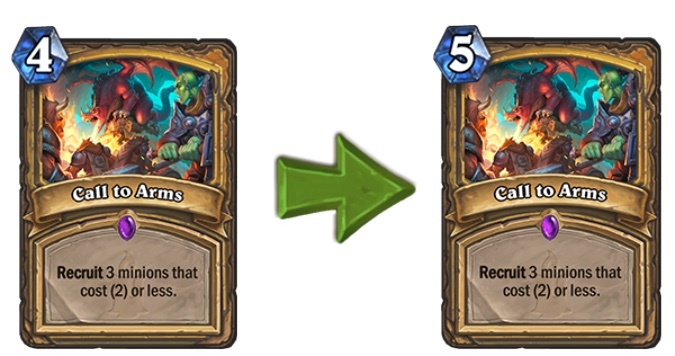 Fortunately for me (but unfortunately for Quest Rogue decks), the reward is getting nerfed: it will now only turn your minions into 4/4s instead of 5/5s. That still makes it a dang powerful deck (and maybe one I still won’t be able to beat), but I think I at least have a shot. The Caverns Below: The Quest Rogue deck uses a strategy that’s strong against slow, control-heavy and fatigue decks, but struggles against most other deck archetypes. There’s a fine line between being powerful against very slow decks and being powerful versus virtually all non-aggressive strategies. By changing the quest reward to make the resulting minions 4/4 instead of 5/5, Quest Rogue should still be a reasonable option versus slow, extreme late-game decks, but offer a less polarized matchup with more moderate control decks. 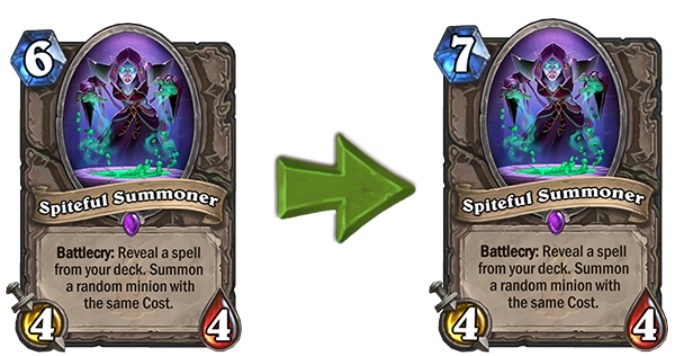 Though it’s dropped out of standard play, the Naga Sea Witch — which reduced the cost of all of your cards to five mana — made for some crazy powerful combos. Combined with giants, who start with a high mana cost that goes down when you take damage or cast spells, you could get some huge minions on the board faster than your opponent could possibly respond. This combo is probably dead, with the Witch’s mana cost bumped from five to eight, significantly slowing down how quickly you can get giants out. Naga Sea Witch: In update 9.1, we introduced a rule change to increase the consistency of Hearthstone game mechanics. 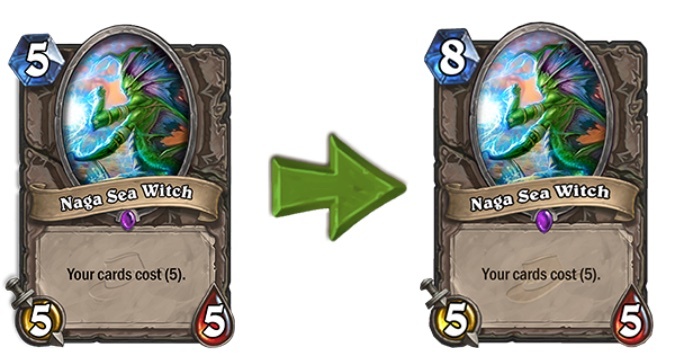 The change affected precisely when Naga Sea Witch’s cost change was applied to cards. This allowed it to be combined with the cost reduction effects on giants, and as a result, it became fairly easy to reduce their mana cost to 0. We think Hearthstone is better all around when interactions are consistent, and we like the fact that a Naga Sea Witch giants deck archetype exists. That said, we also understand that, with its current functionality, this deck can generate early board states that are unreasonable for most classes to deal with. 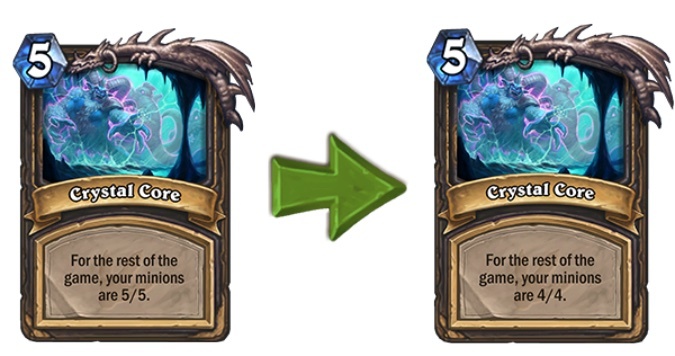 By increasing the cost of Naga Sea Witch to 8 mana, the deck’s concept remains intact, but the combo is delayed until later in a match when more decks are likely to have the tools to handle the arrival of so many giants.